Ruhr Universität Bochum has over 40,000 students and 4,500 permanent employees. Here you can study everything from film, language and African culture, through history, engineering and astrophysics, to gases’ thermophysical properties. And precisely because of this last thing were participants of the EU project IMPACTS gathered in Bochum two days in the end of October. 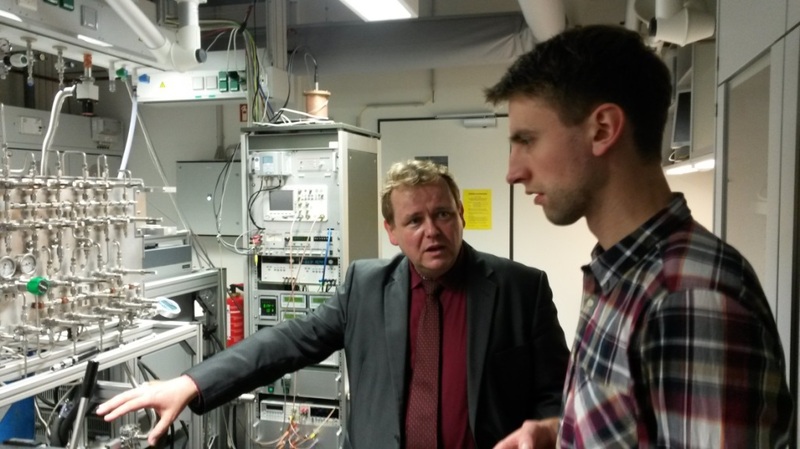 The host for the visit was Professor Roland Span, professor within the field called thermophysical properties. The IMPACTS project concerns pipeline transport of CO2 as an integral part the CO2 capture and storage concept. During such transportation, knowledge of CO2 gas properties such as thermal conductivity, viscosity, pressure and temperature of transition between the phases (solid-liquid-gas) and other are important and essential. This has been Professor Roland Spans’ area of research for many years, both in determining these properties accurately in the laboratory and predicting the properties by developing equations that say something about how CO2 will behave under different pressures and temperatures. Professor Span is also one of the researchers behind the Span-Wagner equation of state. This is an equation which predicts the behavior of pure CO2 very accurately, and which is widely used for us who work with CO2 capture, transport and storage. Professor Roland Span and his research group are partners of the IMPACTS project and they contribute with both experimental and theoretical research.